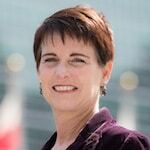 Beth Porter has over two decades of experience in financial inclusion throughout Africa, Asia and Latin America. At UNCDF she provides policy guidance on financial inclusion, particularly to advance responsible finance and promote financial access of women and youth. She also supports the transition of payments from cash to electronic as an advisor to the Better Than Cash Alliance. Porter is on boards of the SMART Campaign, International Child and Youth Finance International, and CRECER, and was a founding member of Women Advancing Microfinance. Porter holds a Master’s degree from Johns Hopkins SAIS and a Bachelor’s degree from Stanford University. She speaks English, French, and Spanish. In addressing humanitarian crises, what unites us—a desire to save and improve lives—is greater than what divides us—outdated perceptions of the roles of aid vs. the private sector. By recognizing this, we can use digital preparedness to set building blocks on the road to resilience.